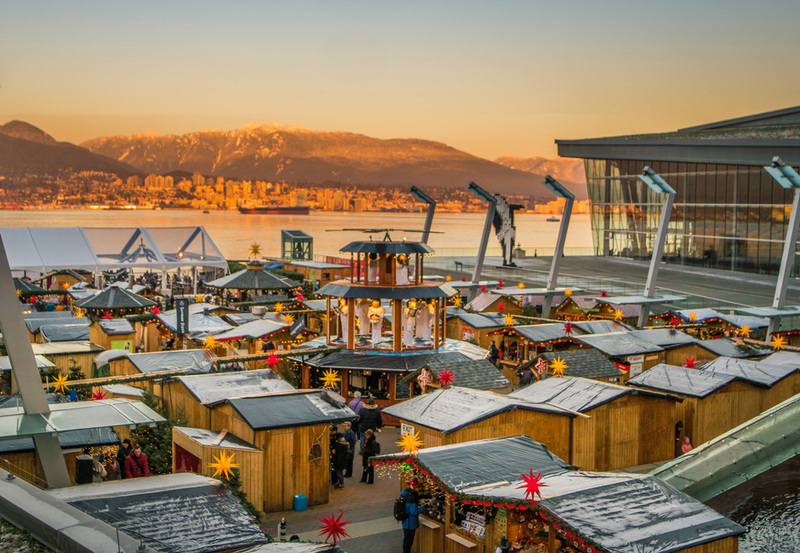 Christmas cheer, a carousel, and a walk-in Christmas tree: the Vancouver Christmas Market is a charming place full of good food and hand-crafted treasures. This German tradition has now become a staple of Vancouver’s holiday season, and I’m sure it’s here to stay with it’s delightful combination of old-fashioned magic and festive atmosphere. Although it was cold and wet on the night I visited, the market offers plenty to see and do, so it was easy to enjoy ourselves despite the weather. We warmed up with a glass of Glühwein (mulled wine) that is available in a cute souvenir ceramic boot and snacked on a soft pretzel while taking an initial browse around the many food and artisan stalls. After some delicious perogies, cabbage rolls, and bratwurst, we took in the live music that was up above the market on the new Flying Stage and strolled around the market while sampling some of the over 75 vendors’ wares and admiring all the beautiful hand-crafted ornaments, clothing, soaps, and candies. After all the hype about the walk-in Christmas tree with its 36,000 lights, it was quite underwhelming. It looks better from the outside, but when you walk in it simply looks like the inside of a fake tree, complete with large concrete blocks holding it in place. The inside could have been dressed up to look much nicer, but it seemed like a bit of a gimmick. The carousel ride was enjoyable but short. A few turns around and up and down on the horses and it was over, but carousels never fail to put a smile on my face and I’m sure it will be a hit with the kids. Our final stop was some dessert from the Cannoli King. We left with stomachs full of local, authentic cuisine and hearts warmed by mulled wine and Christmas cheer.